Goals from Ben Pearson and Jordan Hugill gave Preston victory over Aston Villa to pile further pressure on visiting manager Roberto di Matteo. Villa have won only one league game so far this season, despite being one of the favourites for promotion. A win for Preston, in their first meeting with Villa at Deepdale in 42 years, saw the hosts extend their unbeaten run to four games and move three points clear of their opponents. Villa, who are now just two points above the relegation zone and 15 adrift of leaders Huddersfield, brought on two more forwards - Rudy Gestede and McCormack - at half-time and looked more threatening after the break. "Money brings you good players, which is what Aston Villa have got. "We have players who want to make careers in the game. They worked, pressed and made it very uncomfortable for Aston Villa. "If that penalty had gone in at the end it would have been an unfair reflection of how the game went, we were worth a two-goal lead. "We asked questions of Villa from start to finish. It was a good way to end the busy schedule that we've had." "There's a team here that is good, it will come good for us. "We will keep working. I have faith in the team, I believe in the team and I think that, come the end of the season, they will be up there. "It's been a bad day at the office for sure. We are 10 points from sixth place so it's still all possible. "It's normal that when the results of the team aren't what you expect, the results will be questioned. That's part of our job." 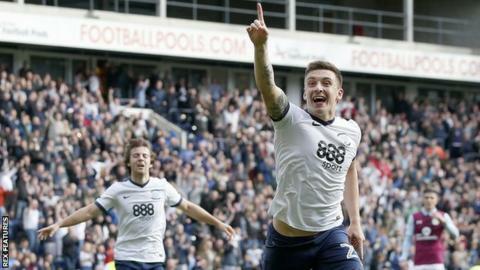 Match ends, Preston North End 2, Aston Villa 0. Second Half ends, Preston North End 2, Aston Villa 0. Corner, Aston Villa. Conceded by Chris Maxwell. Penalty saved! Ross McCormack (Aston Villa) fails to capitalise on this great opportunity, right footed shot saved in the bottom right corner. Bailey Wright (Preston North End) is shown the yellow card for a bad foul. Penalty Aston Villa. Jonathan Kodjia draws a foul in the penalty area. Penalty conceded by Bailey Wright (Preston North End) after a foul in the penalty area. Foul by Jordan Amavi (Aston Villa). Jordan Amavi (Aston Villa) wins a free kick in the defensive half. Corner, Preston North End. Conceded by Jordan Amavi. Substitution, Preston North End. Alan Browne replaces Ben Pearson. Attempt blocked. Jordan Ayew (Aston Villa) right footed shot from the left side of the box is blocked. Assisted by Ross McCormack. Foul by Ross McCormack (Aston Villa). John Welsh (Preston North End) is shown the yellow card for hand ball. Hand ball by John Welsh (Preston North End). Corner, Preston North End. Conceded by Tommy Elphick. Attempt blocked. Callum Robinson (Preston North End) left footed shot from outside the box is blocked. Jordan Amavi (Aston Villa) is shown the yellow card. Jordan Hugill (Preston North End) wins a free kick on the right wing. Attempt missed. Ross McCormack (Aston Villa) right footed shot from outside the box is close, but misses to the left from a direct free kick. Substitution, Preston North End. Paul Huntington replaces Aiden McGeady because of an injury. Delay in match Aiden McGeady (Preston North End) because of an injury. Substitution, Aston Villa. Jordan Amavi replaces Aly Cissokho. Attempt missed. Greg Cunningham (Preston North End) left footed shot from outside the box misses to the right. Assisted by Daniel Johnson. Attempt blocked. Ross McCormack (Aston Villa) right footed shot from the left side of the box is blocked. Assisted by Rudy Gestede with a headed pass. Attempt missed. Albert Adomah (Aston Villa) right footed shot from outside the box is too high. Assisted by Jordan Ayew. Foul by Jordan Ayew (Aston Villa).